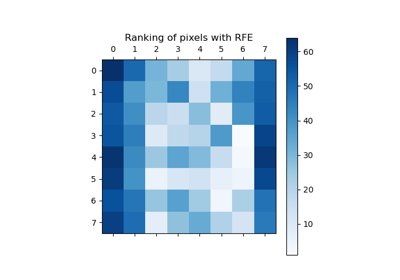 Feature ranking with recursive feature elimination. Given an external estimator that assigns weights to features (e.g., the coefficients of a linear model), the goal of recursive feature elimination (RFE) is to select features by recursively considering smaller and smaller sets of features. First, the estimator is trained on the initial set of features and the importance of each feature is obtained either through a coef_ attribute or through a feature_importances_ attribute. Then, the least important features are pruned from current set of features. That procedure is recursively repeated on the pruned set until the desired number of features to select is eventually reached. A supervised learning estimator with a fit method that provides information about feature importance either through a coef_ attribute or through a feature_importances_ attribute. The number of features to select. If None , half of the features are selected. The number of selected features. The mask of selected features. The feature ranking, such that ranking_[i] corresponds to the ranking position of the i-th feature. Selected (i.e., estimated best) features are assigned rank 1. The external estimator fit on the reduced dataset. Guyon, I., Weston, J., Barnhill, S., & Vapnik, V., “Gene selection for cancer classification using support vector machines”, Mach. Learn., 46(1-3), 389–422, 2002. The following example shows how to retrieve the 5 right informative features in the Friedman #1 dataset. decision_function(X) Compute the decision function of X.
fit(X, y) Fit the RFE model and then the underlying estimator on the selected features. predict(X) Reduce X to the selected features and then predict using the underlying estimator. predict_log_proba(X) Predict class log-probabilities for X.
predict_proba(X) Predict class probabilities for X.
score(X, y) Reduce X to the selected features and then return the score of the underlying estimator. transform(X) Reduce X to the selected features. The decision function of the input samples. The order of the classes corresponds to that in the attribute classes_ . Regression and binary classification produce an array of shape [n_samples]. If True, the return value will be an array of integers, rather than a boolean mask. An index that selects the retained features from a feature vector. If indices is False, this is a boolean array of shape [# input features], in which an element is True iff its corresponding feature is selected for retention. If indices is True, this is an integer array of shape [# output features] whose values are indices into the input feature vector. X with columns of zeros inserted where features would have been removed by transform . The class log-probabilities of the input samples. The order of the classes corresponds to that in the attribute classes_ . The class probabilities of the input samples. The order of the classes corresponds to that in the attribute classes_ . Reduce X to the selected features. The input samples with only the selected features.